This Error Message Article explains the LABELVIEW error message “The product CODESOFT 2018 is already installed on this machine. Please first uninstall it to be able to install LABELVIEW 2018” and details how to fix the underlying problem that caused it to appear. The opposite is also possible: a message indicating that LABELVIEW 2018 cannot be installed because CODESOFT 2018 is already installed and needed to be removed first. 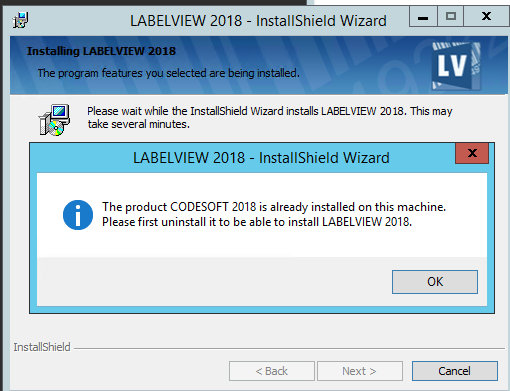 LABELVIEW 2018 installation program detects that CODESOFT 2018 is already installed on the computer and would not proceed unless CODESOFT 2018 is removed. At this time, we cannot confirm the reasons behind this restriction.